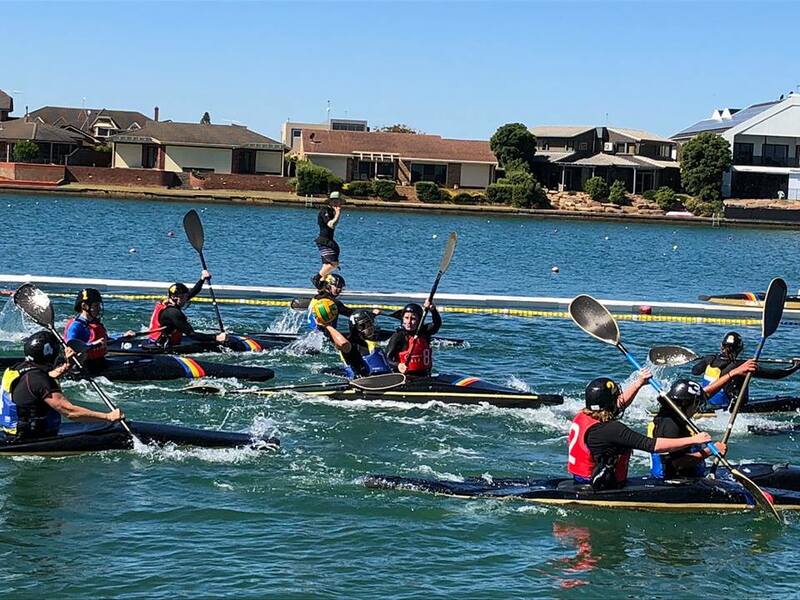 More than one hundred athletes from around Australia descended upon the Rowing SA Regatta Centre at West Lakes to compete at the 2018 Australian Canoe Polo Championships held over the Easter long weekend. The Championships attracted the country’s finest athletes from South Australia, Victoria, Queensland, New South Wales, Queensland, WA and the Northern Territory competing in the categories of under 18, under 21, Open Men, Open Women and Masters. Guest athletes from New Zealand and Hong Kong added an international edge to the tournament. Host state South Australia took out Gold in the coveted Open Men’s Category with a 4-3 Grand Final win against NSW. ACT proved too strong in Open Women’s against Victoria with a 6-4 win, whilst U21 Victoria defeated Queensland 10-2, Queensland defeated ACT 5-3 in U18 and NSW Masters proved too strong for Victoria in a 5-4 win in overtime. The Australian Championship trophy went to Victoria as the best overall performing state at the tournament. Final selection for Australian Women and Men’s canoe polo teams took place during the event and the successful athletes will compete at the 2018 World Canoe Polo Championships, Welland Canada in August (1-5 August 2018). Canoe Polo is a fast and exciting competitive ball sport played on water, where individual kayak paddlers work in teams of five to shoot a ball into a goal suspended two metres above the water. Tactics of the sport make it exciting spectator viewing and include fast paced paddling, tackling an opponent’s kayak, rolling under water, passing the ball by hand or a paddle “flick”. Paddles can be used to intercept passes and block shots at goal. The Australian Canoe Polo Championships are an annual sporting event that is regarded as the premier and largest participation sporting event for canoe polo in Australia. The Championships are hosted each year by a different state in Australia on a rotational basis. Athletes are selected to represent their home state or territory in the categories of micro junior (under 10 years), Junior (under 18 years), Open Men, Open Women, Veterans (over 35 years) and Masters (over 45 years).